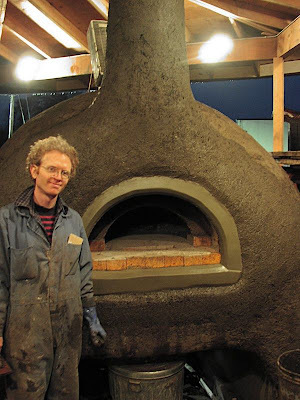 Washington College News: A Natural Builder Presents "Earth, Art, and Fire: Reviving Traditions for Post-Industrial Dilemmas"
A Natural Builder Presents "Earth, Art, and Fire: Reviving Traditions for Post-Industrial Dilemmas"
Kiko Denzer with one of his mud ovens. CHESTERTOWN, MD—The Center for Environment & Society (CES) at Washington College will present “Earth, Art, and Fire: Reviving Traditions for Post-Industrial Dilemmas” by Kiko Denzer at Litrenta Lecture Hall in the Toll Science Center at Washington College on Tuesday, October 30 at 7 p.m. This talk is free and open to the public. A leading proponent of natural building, Kiko Denzer has worked with earth as a building material since 1994. His work has included low-cost, friendly structures for schools, playgrounds, gardens, and community events. The goals of his work are two-fold: “to bring the art and beauty of life and nature into spaces where we work and live, and to inspire people to create what they need with the materials they have on land.” In order to accomplish these things, Denzer begins with primary tools such as our hands and bodies. 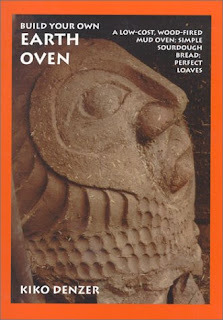 Since 1994 Denzer has been involved in numerous projects involving mud – constructing mud ovens, stoves, fireplaces, and sculptures. His other interests include stone- and wood-carving, teaching and writing. Based in Oregon, he self-publishes how-to books on natural building methods through his company Hand Print Press. His first book, Build your own Earth Oven, is widely regarded as the authority on the construction of traditional earth ovens. He also has written and published Dig Your Hands in the Dirt: A Manual for Making Art out of Earth, and Make a Simple Sundial. Denzer’s talk at Washington College is sponsored by the Center for Environment and Society, the Student Environmental Alliance, the Anthropology Department, and the Anthropology Club. For more information, visit http://www.ces.washcoll.edu or call 410-810-7161.